MANILA, Philippines - Their love story is certainly no fairy tale, but celebrity doctors Vicki Belo and Hayden Kho have proven that their love is much bigger than the trials and controversies they faced through the years. After 12 long years, the couple have finally said their “I do’s” in a civil wedding ceremony. 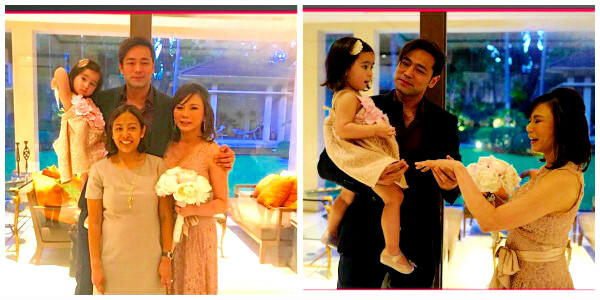 The simple ceremony, officiated by Makati Mayor Abby Binay, was witnessed by their 2-year-old daughter, Scarlet Snow Belo. The celebrity doctors shared photos of the event in their respective Instagram accounts. "I was afraid that I would feel like I would lose my freedom by getting married. Instead, I feel joyful and free. Thank you [Mayor Abby Binay] for officiating our civil wedding,” Belo wrote. "Therefore shall a man leave his father and his mother, and shall cleave unto his wife: and they shall be one flesh,” Kho said. In a Philippine Daily Inquirer report last April, it was revealed that the long-time couple are planning to get married in Paris, France this coming September. According to said report, Belo and Kho reportedly sent a private message to some of their closest friends regarding the planned wedding. "This is Scarlet Snow Belo and I would like to invite you to be present when my parents, Daddy Hayden and Mommy Vicki, get married in our favorite city, Paris,” the text invitation reads. Do you, Mommy, take, Daddy, as your lawfully wedded husband? Yes or yes yes yes? Their on-and-off relationship made headlines in the past years. In 2009, the couple decided to part ways after Kho and actress Katrina Halili got involved in a scandal that was investigated in the Senate. Kho’s medical license was revoked because of it. But in 2014, the Board of Medicine under the Professional Regulation Commission (PRC) reinstated Kho’s medical license. Kho, Belo and Halili have since reconciled. Soon after, the couple had Scarlet Snow in 2016 through in vitro fertilization. Belo was previously married to businessman Atom Henares, with whom she has two children, Quark and Cristalle.